Elen Davies, Head of New Directions Pharmacy attended the event and said ‘what a wonderful occasion to bring the Cardiff business community together. The cherry on the cake for us was seeing our Chairman acknowledged for his contribution. 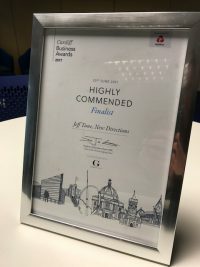 Our business has consistently grown year on year, and awards like this are acknowledging that we are delivering above and beyond’.